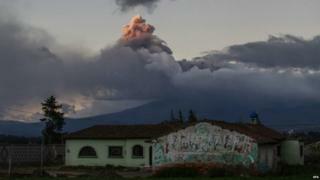 Hundreds of thousands of people living south of the Ecuadorean capital, Quito, could be at risk from an eruption of the Cotopaxi volcano, officials say. The volcano, located about 50km (30 miles) from the city, last erupted on Saturday, prompting President Rafael Correa to declare a state of emergency. Risk Management Minister Maria del Pilar Cornejo said 325,000 people lived in areas that could lie in the path of mud and rock flows from the Cotopaxi. Its last major eruption was in 1877. Cotopaxi is one of Ecuador's most active volcanoes and, at 5,897m (19,347 ft), its second-highest peak after the Chimborazo. On Friday, it shot ash 12km (seven miles) into the air. Hundreds of people were evacuated from the slopes of the volcano. President Correa also prohibited media from publishing any information about the Cotopaxi's activities other than that from official sources. Free-speech groups criticised the move, but Mr Correa said it served to "guarantee citizens' safety" by preventing panic spreading or people being lulled into a false sense of security. Ms Cornejo said the biggest risk to those living near the volcano would be from fast-moving mud and rock current. During the 1877 eruption, such currents melted the ice cap covering the Cotopaxi's peak. The resulting mudflow destroyed the nearby town of Latacunga.